Lockheed Martin has dovetailed since hitting a 52-week high last April. The defense contractor has plummeted 15 percent since that peak, buffeted by every new development in U.S.-China trade discussions. One technical analyst sees a rebound in the making after a rough 12 months. 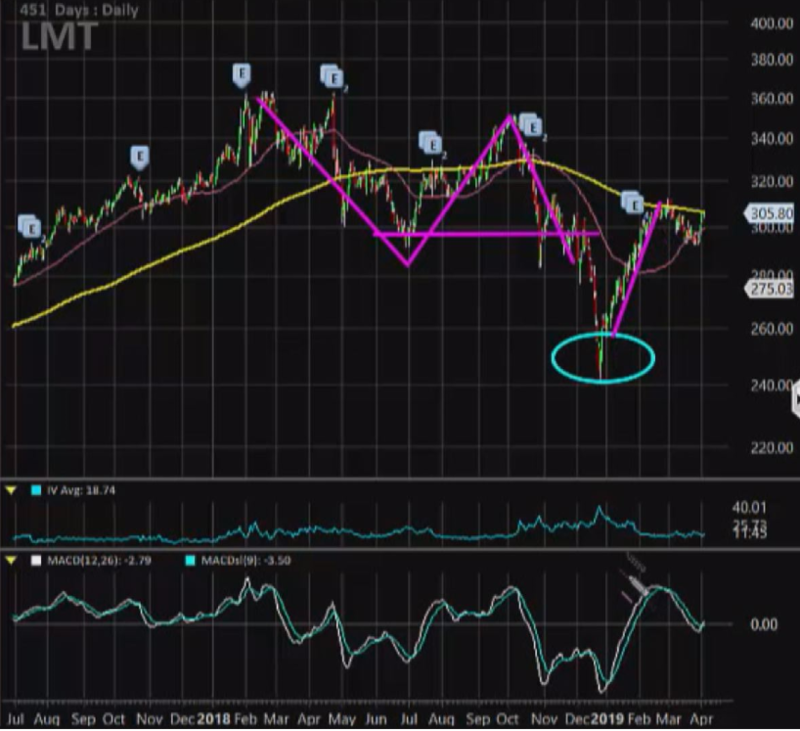 "It's been a bit of an underperformer in the defense sector, but we're seeing signs on the charts here, on the technical position, that we could be in for a little bit of a comeback rally," TradingAnalysis.com's Todd Gordon said Tuesday on CNBC's "Trading Nation." Since the beginning of 2018, Lockheed has been in the middle of a three-wave correction, according to Gordon, first, tumbling from its February peak, then rallying off its midyear low, and finally falling even harder to its December bottom. Now it is setting up for a rally. "I like the formation of this chart just with this little move right here," said Gordon. "We've got a nice push up here from $240. We've fallen into a little bit of a bull flag here, a little bit of a consolidation." Lockheed Martin has surged 26 percent since hitting bottom on Dec. 26. It now rests between its 200-day and 50-day moving averages. "It looks like should the broader market continue, we should be able to pierce up through that 200-day moving average. Now the upside target here is we should be looking for this old high just around $350 a share," said Gordon. A return to $350 would mark a rally of more than 15 percent from current levels. However, it would still sit 4 percent below its record. On its way to $350, Gordon is buying the May 17 expiration 320/330 call spread for roughly $1.78. The trade pays off the most if Lockheed Martin rises above $330 by the expiration date.